This fast-moving show starring New Amen Corner is a must for lovers of ‘60s music. Expect a multimedia presentation and special guest appearances from 60s icon Mike d’Abo and multi-award winning Nancy Ann Lee ‘little Miss Sixties’. An evening of mistaken identities, witty banter and delightful absurdities is in store courtesy of Ampthill and Flitwick Dramatic Society. Penned in 1895, the play takes a tongue-in-cheek look at the customs of Victorian life through the eyes of the protagonist Jack Worthing, a serious young man (played by Hugo Henche) and his unwanted sidekick Algernon Moncrieff, a somewhat happy-go-lucky, lovable rogue (played by Scott Younger). Eager to escape the constraints of proper society, the two young men invent circumstances and double identities allowing them to behave exactly how they wish without consequence. But the lies quickly get out of hand and the young men risk losing the loves of their lives. The young men’s love interests are Gwendolen (played by Tracey Callan), a flirtatious and savvy young woman who has Jack wrapped around her little finger, and Cecily, a sweet innocent young lady who captivates Algernon’s affections with ease (played by Sarah Vanstone-Howe). In supporting roles are Alistair Kelly as Lane, Aldo Saralli as Dr Chasuble, Helen Morris as Miss Prism and Robina Chatham as Merriman. Directed by Sarah Benjamin, the play will be performed in the round. Watch as the two men try to win over the imposing Lady Bracknell (played by Samantha Jayne Golton Scholes), decipher the meaning of a handbag found at Victoria station and find the answer to the question on everybody’s lips, who is the mysterious man called Ernest? Open-air theatre is coming to Wrest Park, promising drama and mystery aplenty. The show, presented by Chapterhouse Theatre, tells how, deep in the beautiful Northumbrian countryside, a terrifying mystery and a legendary nemesis await the arrival of the world’s greatest detective. When the wife of Doctor Watson suddenly disappears, a desperate quest to find her begins. Sherlock Holmes comes face to face with his greatest fear at the hands of his mortal enemy in this stunning new tale of romance and suspense. The Imagine Luton festival returns to bring the streets of Luton to life once again with outdoor performances. 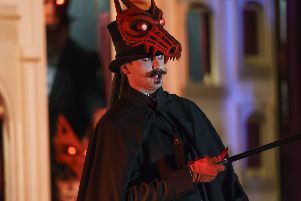 With all kinds of interactive theatre, dance, circus and music experiences on offer, the festival promises something for everyone and is free for all the family to enjoy. This year’s festival will celebrate the 250th anniversary of a great British invention – the circus – with its very own Big Top tent appearing on St George’s Square and a host of incredible marvels and acts, including the return of Mimbre acrobats, who wowed audiences last year. Audiences can expect to stumble upon amazing acrobatic and aerial feats, magical illusions, mischievous characters, lifesize Jenga blocks, dancing grannies, a row boat with its own stormcloud, high-energy hip-hop and Indian dance, a wacky bee colony, a strong lady and a marching rock band. Ride the Stairway To Heaven with rock tribute favourites Purple Zeppelin as they pay tribute to two of the greatest rock bands of all time, Deep Purple and Led Zeppelin. Purple Zeppelin are four talented and versatile musicians who are dedicated to providing fully immersive experience shows. They promise to take the audience back to the magic, the excitement and the sheer raw energy generated by Deep Purple and Led Zeppelin. The two-and-a-half hour show features special effects, audience participation and more than 30 hits to please rock fans.